TicketPrinter — ITI - Information Technologies, Inc. The new RuggedJet™ printers print 2" to 4" documents – and labels – at up to 5 ips. They can connect wirelessly to your handhelds and laptops. They are designed to handle what the real world dishes out every day with IP54 certification to withstand dust and moisture, and 6 ft. drop protection. With a 2-year “bumper-to-bumper” warranty** against defects and damage, standard, they also offer one of the best standard warranties in their category of 4" mobile printers. Their thermal printing technology means there are no inks, toners or ribbons required. There’s only one consumable – Brother™ media on convenient drop-in rolls to make changing supplies fast and easy – and therefore less to worry about in the field. 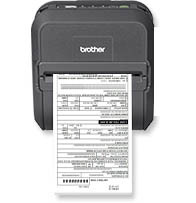 Now you can quickly and reliably print documents and labels up to 4" wide in the field – with the new RuggedJet™ mobile printers from Brother™.